This German StuG III Sturmgeschütz Ausf. D Tank Destroyer Sd.Kfz.142 is kept at the Swedish Tank Museum (www.Arsenalen.se) near Stockholm. It is a very rare vehicle. There are only three left. This is the most intact example. It is currently in storage and can only be viewed by special request on weekdays. This is a shame as I believe it is the only original example left of the model Ausf D. There is one that is half embedded in concrete as part of the Volokolamsk Highway Monument, Volokolamsk, Moscow Oblast, Russia. A third is being rebuilt from a wrecked chassis in Kent, UK. This StuG III Ausf. D was purchased from Norway after WW2, for evaluation. The Germans used their obsolete vehicles in a policing role in occupied countries. The Germans in Norway surrendered without destroying their weapons when the war ended. Sweden took the opportunity to get it's hands on German military technology to see if it could help in its own tank development program. The German Army in WW1 realised that they needed a weapon that could provided direct fire infantry support to remove enemy fortifications, artillery emplacements and machine gun posts. The Germans only produced twenty A7V heavy tanks during WW1. This was not enough. The German LK II light tanks were not built in enough quantities to see active service before the war ended. The German Colonel Erich von Manstein submitted a report in 1935 proposing that assault artillery units Sturmartillerie should be established to provide direct fire armoured infantry support. This was very much along the lines of the British Infantry tank role, except the Germans did not waste their main battle tanks on performing this function. In 1936 Damiler-Benz AG were given the job of producing an armoured self propelled assault gun that could mount the short barreled low velocity 75 mm StuK 37 L/24 gun that could fire high explosive HE rounds at enemy infantry, soft skinned targets as well as gun emplacements. They had to be able fire armour piercing AP rounds. The crew had to be housed inside the vehicle that had overhead protection. It also had to have a low profile. 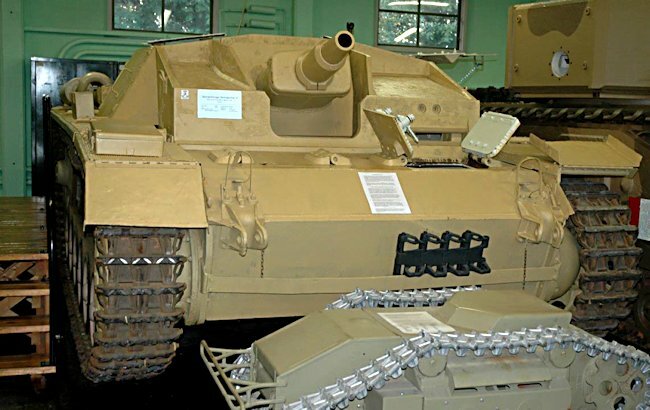 Damiler-Benz had been producing Panzer MarK III tanks so rather than go through the expense of designing a new chassis they used what was currently in production as a basis of the new vehicle. 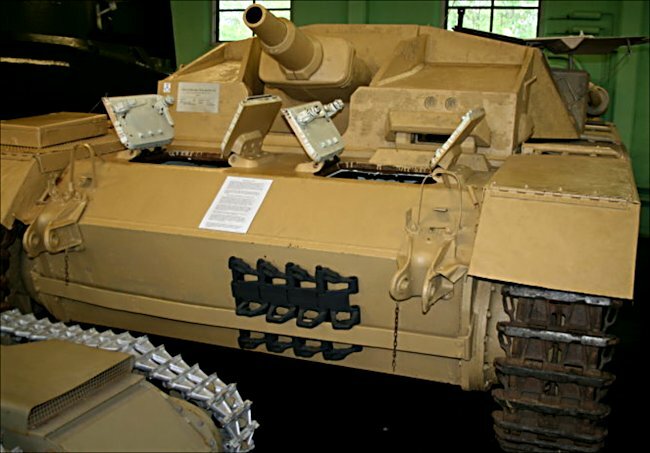 The assault gun versions of this new armoured vehicle became known as StuG III Ausführung (version) A to E. They were a lot easier and cheaper to produce than the Panzer MkIII tank. Where can I find other preserved Sturmgeschütz III's?